Every end marks a new beginning and for sports aficionados around the world, the end of the 2018 FIFA World Cup ushers in the start of the Rugby World Cup Sevens. The tournament may not be as prolonged or extensive as the just concluded football extravaganza in Russia, but the global audience it attracts will nonetheless be treated to finger licking encounters that will end with the crowning of a new world champion. Kenya will be amongst the 24 teams bidding to clinch the much coveted Melrose Cup in the men’s category, while the Kenya Lionesses will not be represented in the Women’s World Cup Sevens which will be settled between 16 teams; South Africa being the continent’s only representative. The three day tournament, which is scheduled to kick off on Friday at the AT&T Park in San Francisco’s Bay Area, will see Shujaa flag off their campaign with a match against Tonga in the preliminary knockout round of 16. 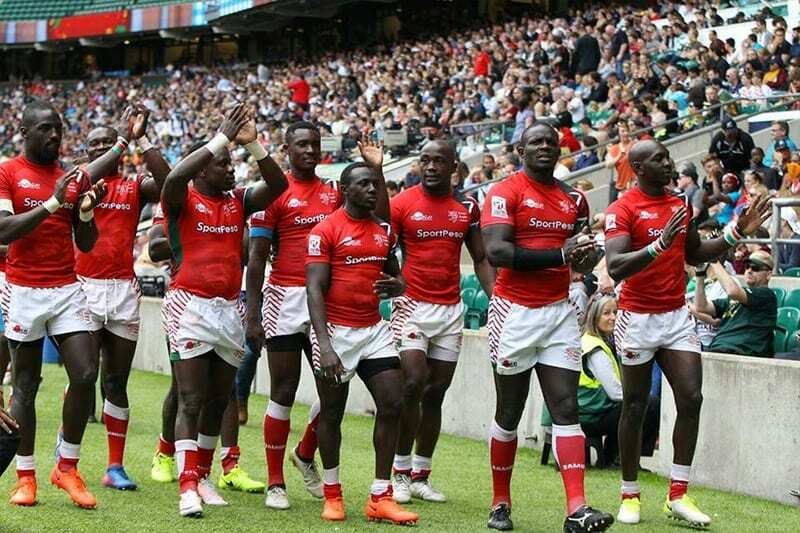 Kenya became one of the eight teams across the globe to have secured automatic slots into this year’s Rugby Sevens World Cup, having finished in the top eight of the 2013 edition held in Moscow; their journey ending with a 12-5 semi-final defeat to England. They may have attained automatic qualification, but the Kenya national rugby sevens team will have to take part in a decisive preliminary round of 16 match against Tonga, as they are seeded ninth in the standings. Teams ranked ninth to 24th are required to go through an initial knock-out preliminary round, whereas nations seeded in the top eight qualify automatically into the round of 16. Kenya head into the tournament on the backend of an impressive campaign in the 2017/18 HSBC Sevens World Series, as they closed the season eighth on the standings having amassed 104 points- their highest season tally since first appearing in the tournament nearly two decades ago. Head coach Innocent ‘Namcos’ Simiyu had set a target of attaining a century of points in the World Series standings, a goal which they put in the shade with a circuit to spare. This by and large explains why the East Africans registered a meager 3-point return on their last outing of the season in Paris, as they let their guard down with the full knowledge that their promise to the Kenyan faithful had been delivered. Among the highlights of last season’s campaign was Shujaa reaching the final in Vancouver and Hong Kong, albeit settling for the silver medal on both occasions after sustaining back-to-back defeats to an overly superior Fiji side. The Flying Fijians, who at the penultimate round of the series enjoyed a seven point cushion at the summit, surprisingly had to make do with a second place finish having been leapfrogged by South Africa who retained the crown by two points after winning gold in Paris. Experience on the Kenyan side will count for plenty, as Shujaa are under the stewardship of Simiyu who featured as a player in two Rugby World Cup Sevens tournaments- Hong Kong in 2005 and Dubai in 2009. Collins Injera on the other hand is on the verge of becoming the first Kenyan player to feature in three Rugby World Cup Sevens, having been named in Innocent Simiyu’s 12-man squad. The 31-year old, who featured at the 2009 tournament in Dubai and the subsequent 2013 edition in Moscow, is Kenya’s all-time try scorer and second overall all-time try scorer in the World Series. Samuel “Smurf” Ng’ethe will be a World Cup debutant having been entrusted with a call up while powerhouse Billy Odhiambo is sidelined from the tournament with a hand injury. Contrarily, Oscar Ouma missed the trip to San Francisco due to personal commitments. This year’s Rugby World Cup Sevens will be the seventh edition since its inception in 1993, with Kenya making their fifth consecutive appearance since first qualifying in 2001. Expectations will as such be as high as they can get for Shujaa, seeing as they reached successive semi-finals in the last two editions of the tournament under the tutelage of Benjamin Ayimba and Mike Friday respectively. Fiji are the highest ranked team to clinch the much coveted prize at -138.89 on 5Dimes while Shujaa are at +6600 to be crowned world champions. A win over Tonga in the preliminaries should be routine, whilst Scotland shouldn’t pose much of a threat to Shujaa. Kenya’s true mettle will by its very nature be tested in the quarter-finals where they could potentially meet South Africa.